I'm finally getting around to writing this blog post about attending the 2nd year MSc Research Conference on the 21st April. I was really excited to be able to hear what the 2nd years had been researching and was really glad I used one of my study days at placement to go along. 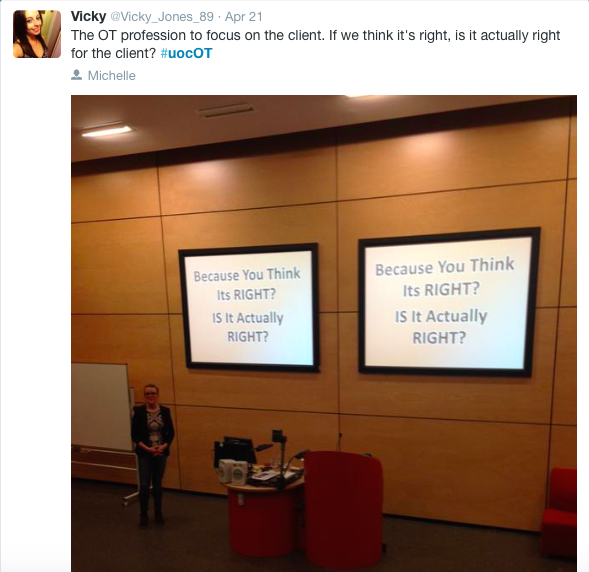 You can check out the conference hashtag #uocOT on twitter to read through the day as a few people were live tweeting throughout, or check out the summary on healthcare hashtag. I'd thought Id share on a few points from the day that I particularly enjoyed and that got me thinking. I really enjoyed hearing about her research journey so far which has seen her also travel to various places around the world. It was also great to see her present the keynote because she also studied the MSc at Cumbria; which I feel was a great encouragement to know how wide and far we can go once graduated. We can set our sights higher and further than just settling into a band 5 role. It allowed me to see that as an OT, the world really is a place to be explored and that the skills we learn as we train will help to take us to a range of different and interesting places if we are brave enough to take that leap. 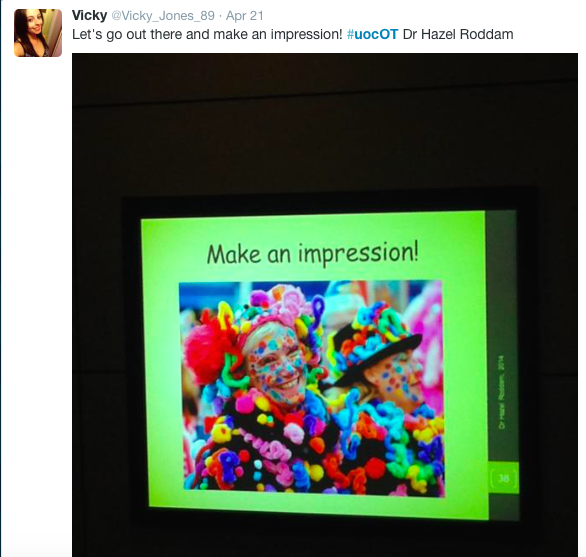 Michelle also projected her passion for research and occupational therapy which was exciting to see. OT spills out into all aspects of out life and the people we work and interact with. 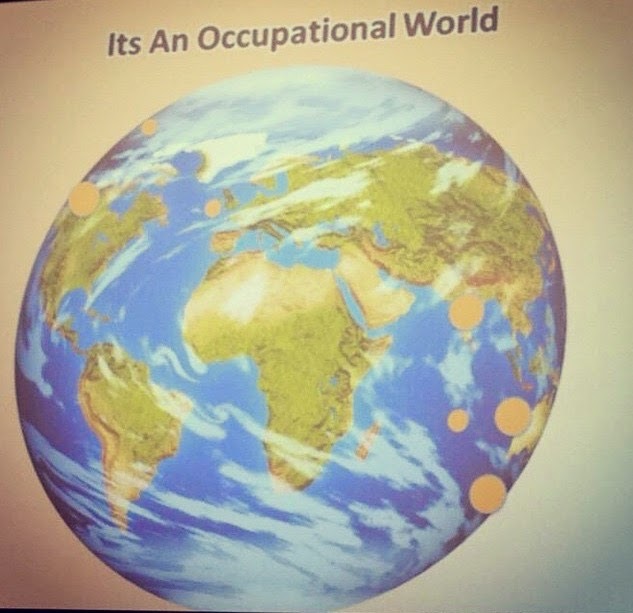 Occupational Therapy is a way of life! I was challenged by Michelle's keynote (Look forward to one day reading her research on performance profiling) even as a student still learning about outcome measures whether they can ever be client centred enough for them to highlight their values and personalised outcomes... Are we finding the clients voice when we use outcome measures - Is it the right one for them as an individual or is it a tick box exercise.. If we say we are client centred surely it is our job to find the best way to get the individuals voice heard throughout our work with them. All of the 2nd year's research was impressive and it's a shame I couldn't hear about them all as the conference was split into 3 sets, but thankful for some tweeting throughout so I got a glimpse of more than I was able to physically hear about. Slightly frightening but also incredibly exciting to think that in a years time it will be my turn to share my research. Sarah Nolan shared her research on the impact of relocation on occupation - focusing on Irish postgraduate occupational therapy students relocating to UK to study. It was great to learn more about the differences in culture and how they impact on students relocating, and on some level I should relate to this as a Scottish student studying in England, without the added stress of setting up bank accounts and practical issues that Irish students have with this transition. I was surprised to hear that Irish students aren't classed as international students like other european students. I was left thinking can universities do more to support Irish students when they come to study in the UK? I also really enjoyed hearing about Alison Shepherd's research findings on the role of occupational therapy support workers and how their role is perceived by OTs, OT students and OT support workers themselves. This area of research interests me as I led an #OTalk on the role of the OT assistant last month, and have worked as an OT assistant before starting the course. It was reassuring to me that Alison's findings did lean in a similar direction to the discussion during #OTalk re: banding/personal level of competencies. Esther Herbert shared her findings on the awareness of occupational therapy among nursing and teaching students, was thought-provoking and relevant to a profession that is increasingly highlighting the promotion of our unique services. 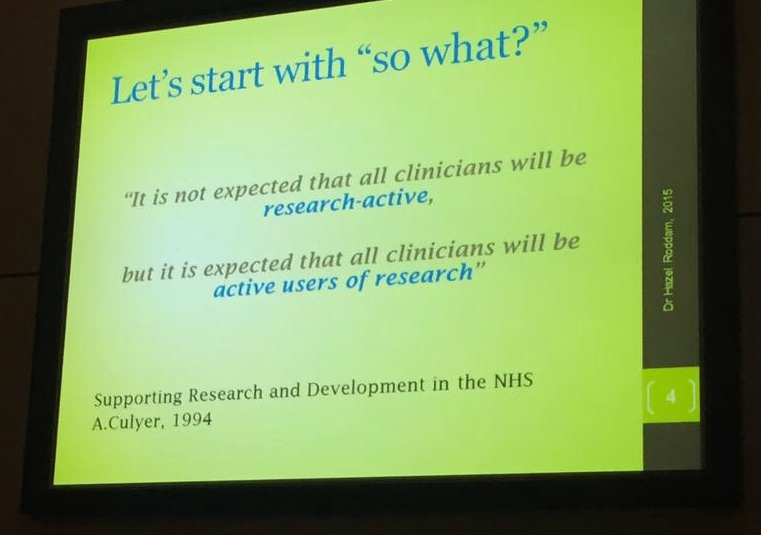 Dr Hazel Roddam discussed being research active in clinical practice and what support is available. She highlighted that we don't all need to be undertaking research but we do need to be actively using research in our day to day roles. The more I hear about the evidence base the more I realise it's importance in decisions I will make as an occupational therapist and it's impact on my clinical reasoning when working with clients. As a student I am aware my opinion is changing on research, when I started this course back in September I was a firmly a 'just need to get this degree' so I can work as an OT. But as the year has gone on the more I feel inspired to help grow and develop the profession I'm set to work in. To be an active part of that journey of development. The day was summed up nicely by Prof Diane Cox, encouraging us of the importance of research and having an evidence base for our profession and challenging us to seek out the opportunities out there and take responsibility for our profession's evidence base. As a first year on the MSc, having the opportunity to hear about research and the practicalities of it from the 2nd year students was really helpful to me, as I start of my 'dissertation'/research journey with the Scholarship and Research methods proposal. The conference also gave me the opportunity to hear more widely about research from previous students and professionals. I left the conference motivated and willing to engage in research more readily. I am also incredibly thankful to study at a university that has some amazing research minds who actively encourage their students to question everything and think critically about the things we encounter both in research and practice. 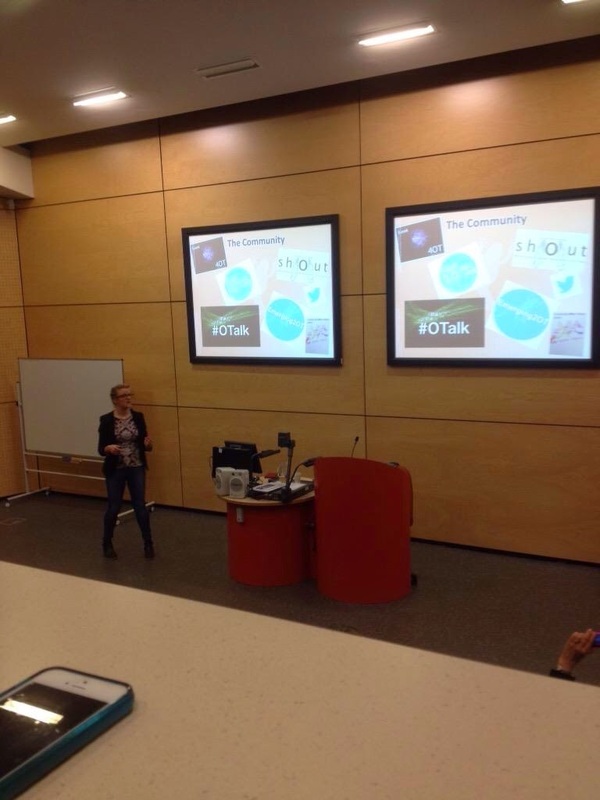 The ability to utilise social media at the conference was a really positive one for me as it allowed me to share my thoughts on research, and the information and communications from the conference not only with other students at my course and university but also with the wider OT student population and the OT profession around the world. A big thanks to @morriskOT and @dianecox61 for their enthusiasm for this throughout the day as it was really positive to see as lover of social media's role in helping develop thoughts, interaction and learning. Cox, D. (2015) 21 April. 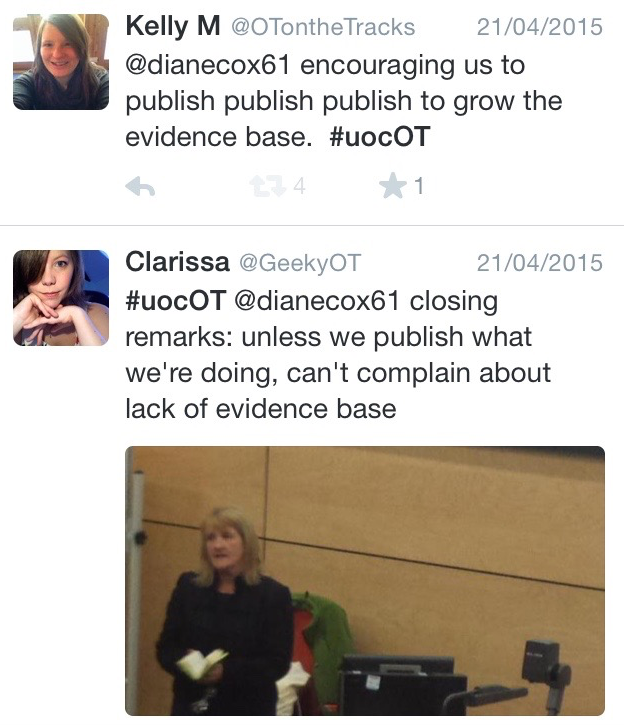 Available at: https://twitter.com/dianecox61 (Accessed 28 April 2015). Cox, D (2015) [Closing Remarks to MScOT Student Conference] HRBO7027: Dissertation. University of Cumbria. 21st April. Healthcare Hashtags (2015) #uocOT Transcript (2015) Available at: http://embed.symplur.com/twitter/transcript?hashtag=uocOT&fdate=04%2F20%2F2015&shour=00&smin=00&tdate=04%2F22%2F2015&thour=00&tmin=00 (Accessed: 29 April 2015). 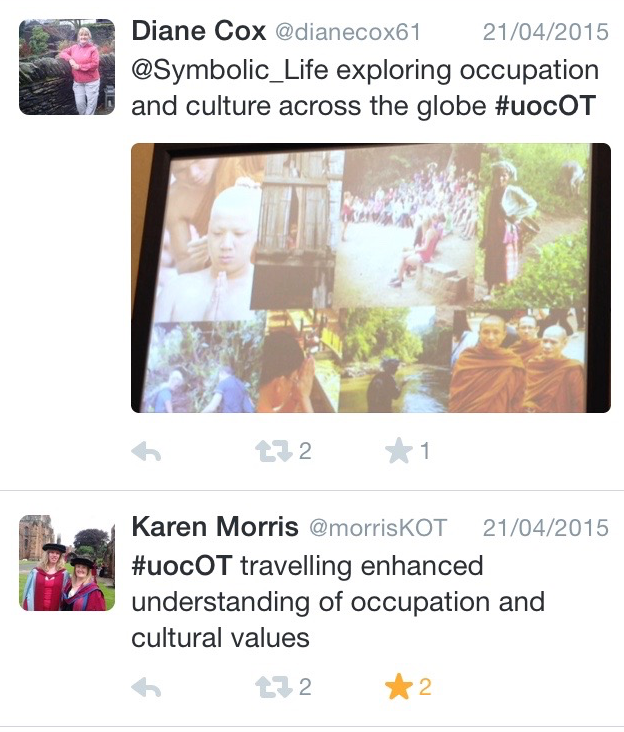 Morris, K (2015) 'MScOT Student Conference: Book of Abstracts and Conference Proceedings', HRBO7027: Dissertation. University of Cumbria. Nolan, S. (2015) [Presentation to MScOT Student Conference] HRBO7027: Dissertation. University of Cumbria. 21st April. Perryman, M (2015) Disruption Breeds Creation [Keynote Lecture to MScOT Student Conference] HRBO7027: Dissertation. University of Cumbria. 21st April. Roddam, H (2015) 'Being research-active in clinical practice: what does that mean and where can you find a helping hand?' [Keynote Lecture to MScOT Student Conference] HRBO7027: Dissertation. . University of Cumbria. 21st April.